Looks like spinach, tastes like cheese! In other words, perfect for the picky eater in your life. I made a scalloped potato and broccoli dish earlier this week, and the cheese sauce that the veggies were covered in was so good that I knew I had to make a veggie lasagna with it. And I did! This iron and protein-rich dish is easy to make, with an ooey-gooey cheesy top and layers of cheesy spinach and pasta, all layered with a garlicky cheese sauce. Mmm…what’s not to love? Easily pulled together, you can freeze this dish before or after baking, or prep it in advance and then just set it aside to be baked just before dinner (or lunch! Or both, because yum!). Let’s get to making it, yes? Mixing up the (3-ingredient) filling! Cook pasta, drain and set aside. 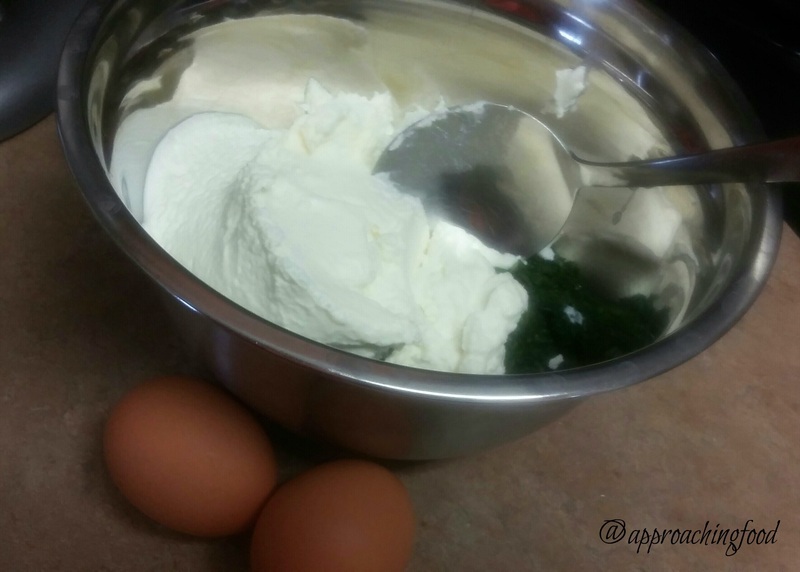 While pasta is cooking, mix spinach, ricotta cheese, and eggs together, and set aside. Make cheese sauce: melt butter and fry onions in the butter until translucent. Add in chopped garlic and fry until fragrant, about two minutes. Add flour, salt, and pepper, stir, and cook for two minutes (to cook the flour). Slowly (and in three separate stages) add in milk. Whisk with each addition of milk. The sauce will be all clumpy at first as it absorbs the milk, but keep whisking and it will smooth out. Once smooth, add in grated cheese, reserving 1 c. of the cheese. Stir until cheese is melted. Set aside. Now it’s time to layer the lasagna! Spread several large spoons of the cheese sauce in the bottom of a lasagna pan. Layer 3 noodles on top. 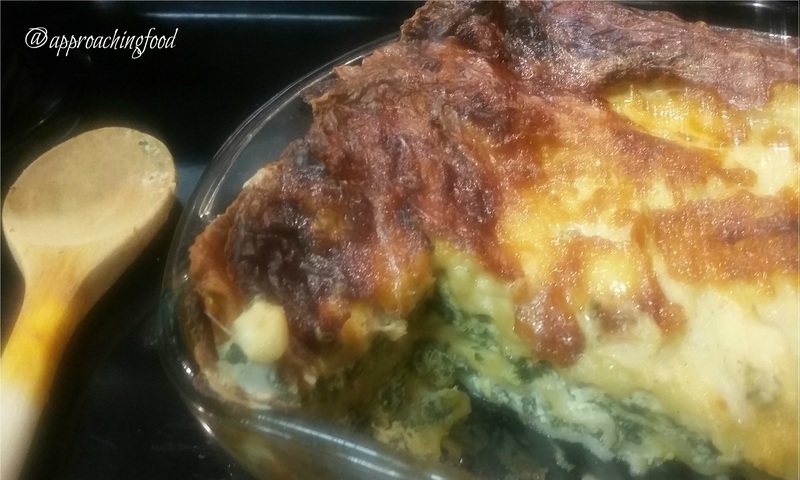 Top with 1/2 of spinach mixture, 1/3 of cheese sauce, and a sprinkle of grated cheese. Repeat the layers. Then place the final 3 noodles on top, spread the last of the cheese sauce on top of that, and sprinkle all the remaining grated cheese on the very top. Bake in a 375 degree oven for half an hour, or until the dish is bubbling and the top is golden brown. Serve with a crisp green salad, and enjoy your delicious meal! Layers of golden crusted cheesy goodness! To a beginner cook (or even a not so beginner one! ), lasagna can be intimidating. But really, it’s rather easy! For this dish, you make the 3-ingredient filling, the cheese sauce, and boil the noodles, and then layer it all up. That’s rather easy, yes? Especially for a hearty, stick-to-your-ribs meal that is great for potlucks, family dinners, or frozen for work lunches! Next Post: Apple Spice Pancakes and The Birth of A Recipe! Looking bunny-rific! 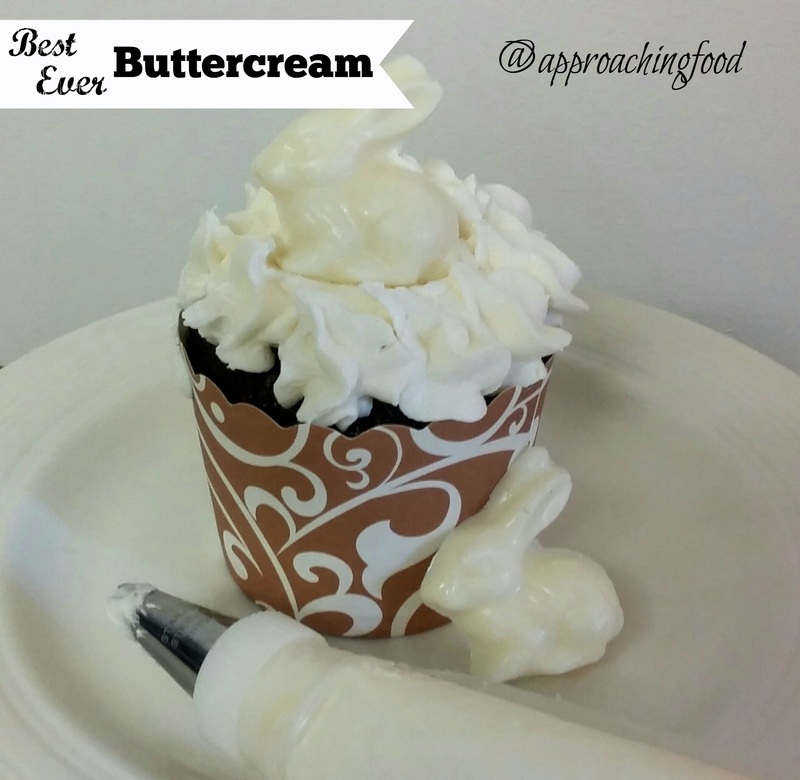 This melt in your mouth buttercream is better than all the superlatives I can type! I like to find (or develop!) the best recipes for everything that I like to eat. The best pizza dough? Got it. The best apple crumble? Got that too. I even found the always perfect chocolate cake/cupcake recipe, and never stray from it, because it’s just so perfect. And I think the only thing to top a chocolate cake with, is real buttercream! I love when people try my buttercream icing — they always make happy nom-nom noises. Music to a baker’s heart! Usually I wing my buttercream recipe, as I know the ingredients and am happy to play around with quantities. Also, sometimes — okay most of the time — I can’t be bothered to measure out ingredients and just eyeball it. But for you, dear blog readers, I finally measured the amounts, and came up with…the only buttercream recipe you’ll ever need! KITCHEN HACK: Use a strawberry huller instead of a cupcake corer — one less item to clutter up your kitchen! 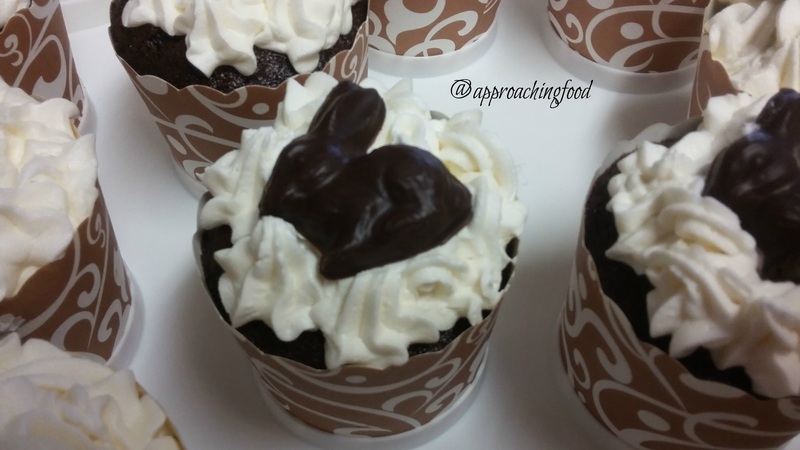 Once I had made a hole in the centre of the cupcakes, I filled it with a mixture of chocolate ganache and whipped cream (essentially a chocolate mousse). Then I piped the buttercream icing on top, and topped the whole thing with a chocolate bunny! The cupcakes were a hit at an Easter dinner that I attended! Want to make some delicious buttercream yourself, and have your friends and loved ones make happy nom-nom noises? Let’s! All nestled in pillowy soft buttercream! Yum-city! Whip butter and shortening together until thoroughly mixed. Add in icing sugar and vanilla, and mix until combined. Beat on high for at least 10 minutes. Spoon into piping bag (or spread on a cake with an offset spatula), and enjoy everyone’s happy mouth-gasms! The shortening is part of what makes the icing so fluffy; the other reason the icing is so fluffeh-licious (what? it’s a word!) is because all the beating adds a lot of air to the icing and makes it pillowy soft (as opposed to super-thick). So don’t skimp on beating the icing! The buttercream will taste delicious no matter how long you mix it for, but it will be extra fluffy and MUCH easier to pipe, the longer you beat it. So *channeling Michael Jackson* BEAT IT, JUST BEAT IT! Sing it with me now, ALL YOU GOTTA DO IS BEAT IT!!!!! Next Post: Something healthy. Probably. Stay tuned! Linking Up at Meal Plan Monday! As well as Happiness is Homemade! This entry was posted in Cakes on April 19, 2017 by Margaret. Hot Cross Buns, looking good, and swiftly consumed! I don’t normally make a lot of fancy-ish breads, because I find waiting for the dough to rise such a pain (Patience? Me? Ha!) but in this case, I mixed up the dough and left it to rise while I went for a walk with the DH and my sister. Then I came back and let it rise for the second time while I made dinner. I baked it during dinner, and then was able to eat it for dessert! Now that’s my kind of baking! A lot of fancy-ish breads (that’s the technical term, doncha know?) are what are called ‘enriched’, which just means that they have more butter/oil, milk, and eggs in them. I decided to start with my basic pizza dough recipe (Easiest Pizza Dough in the History of Ever) and enrich it with milk, a dollop of butter, and some eggs. And whadya know, it turned out fantastic! I think my goal of making an easy, no-fuss hot cross bun recipe was achieved! Want to make some yourself? Let’s! Mix yeast and milk and let sit until foamy, about 15 minutes. 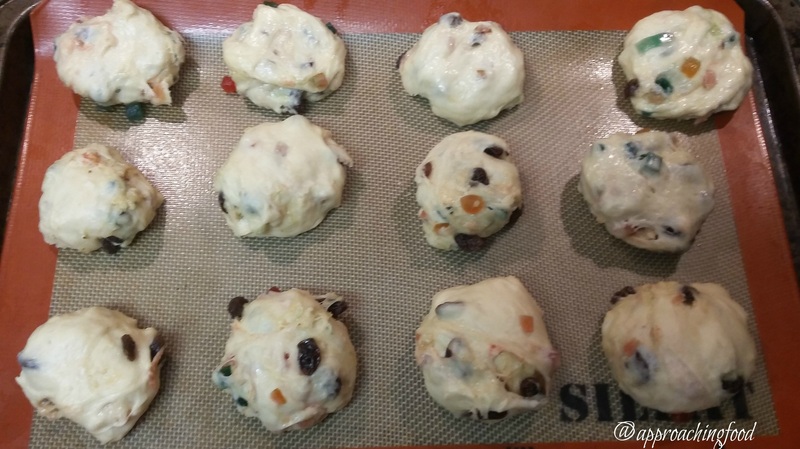 In a mixer (or by hand), mix in remaining ingredients, except for raisins, candied fruit, and one egg, until dough forms. Then mix in raisins and candied fruit. Let rise in a warm place for about an hour or until dough is doubled in size. Punch down dough, and cut into 12 pieces. Form each piece into a ball, and place on a greased cookie tray, or silicone mat. Let rise again, until doubled in size. Beat the remaining egg, and brush it on the tops of the buns. This will give the buns the characteristic golden-brown crust. Bake in a 375 degree oven for 15 minutes, or until buns sound hollow when you knock on the bottom of one. Let cool. Mixing icing sugar and lemon juice together, and drizzle on buns in a cross shape. Eat! And delight in your deliciously fruity buns! (Hmm. Perhaps I should rework that last sentence.) Point is, they’re yummy! I realized after I made these, that I forgot to add in the spices (the cloves, nutmeg, and cinnamon). I told my mom. I guess I haven’t changed that much since I was little; once a sweet tooth, always a sweet tooth! Next Post: Maybe some Easter cookies? I’m actually off to bake cookies with the son of a friend right now! Linking up at Meal Plan Monday, Happiness is Homemade, and Inspire Me Monday! This entry was posted in Uncategorized on April 10, 2017 by Margaret. Way more delicious than the colour suggests! Technically it’s spring, but Mother Nature doesn’t seem to have gotten the memo. I went to work on Friday with a spring jacket on, and leather loafers on my feet; I walked home in a snow storm, shoes squelching soggily all the way. 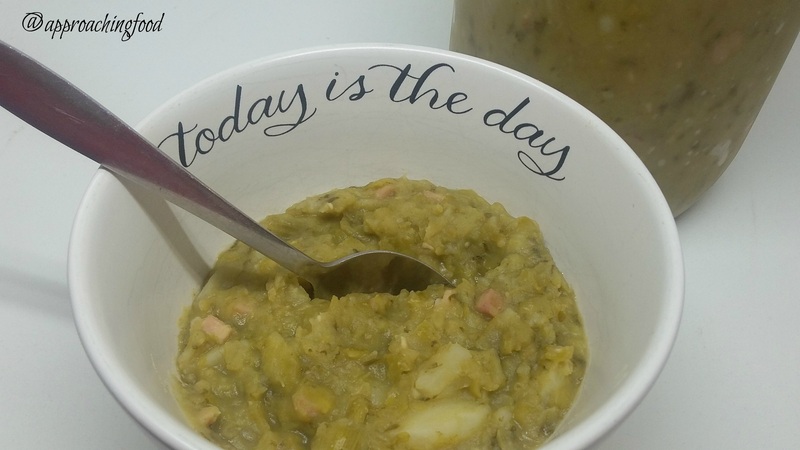 Luckily, I had some delicious pea soup in the fridge that I had made a few days ago, and that warmed me right up! Pea soup is one of the few foods that actually gets better with age. There’s an old children’s song that goes “bean porridge hot, bean porridge cold, bean porridge in the pot, nine days old! I like it hot, I like it cold, I like it in the pot, nine days old!” This soup will likely not last for nine days in your fridge, but if it did, it would probably taste even better than the day you made it! Why does it taste better the next day? I think it gives the peas have a chance to absorb more flavours and liquid, and the flavours themselves have a chance to spread and meld better. The soup definitely thickens up a bit after day one. In fact, I recommend making it the day before you want to eat it. It really is better the next day! This soup is perfect to make and keep in the freezer for days when all you want is a steaming bowl of soup to warm you up. Plus, it’s super-nutritious and high in protein. And did I mention that it’s super-easy to make? The hardest part is stirring the soup, no joke. I got this recipe from my mom, and adapted to what I had in the house. Now, let’s make some soup! Boil 8 cups of water in a large soup pot. Add all ingredients except for meat. Simmer on low heat for about 3 hours, stirring regularly. Be sure to stir regularly, as the soup thickens quickly and will burn easily. So stir, baby, stir! Once soup is done, stir in meat, and add pepper to taste. Bean porridge hot, bean porridge cold! I left the ham out of my portion of the soup, being a vegetarian and all, but from my meat-eating days, I remember how deliciously flavoured the soup became once some ham was added. If you have some sausage lying around, you could add that in too. In other words, feel free to substitute! My mom recommends ‘rookworst’, which is a type of smoked sausage, but when I made the soup this time, I added in some bacon I had picked up from a local butcher. This made the DH (a confirmed meat-a-tarian) very happy! Ah, the things I do for love! If you make this soup, let me know in the comments what type of meat you used (or if you even used meat). Let’s inspire each other! 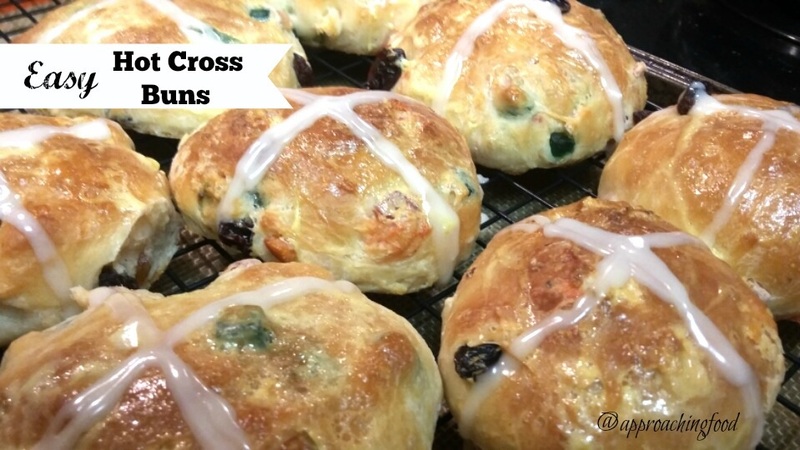 Next Post: Easter approaches, and I’ve been craving some hot cross buns. So maybe those! Or maybe a recipe for homemade healthy meal replacement bars. Any preferences? 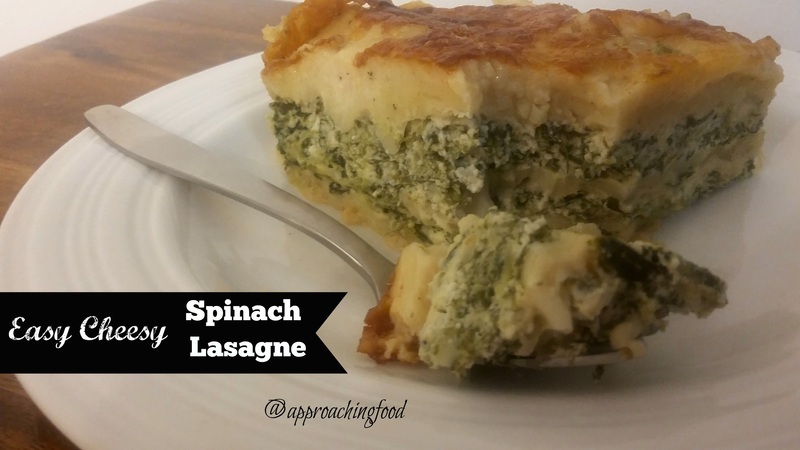 Linking Up at Meal Plan Monday and Happiness is Homemade! This entry was posted in Soups on April 3, 2017 by Margaret. 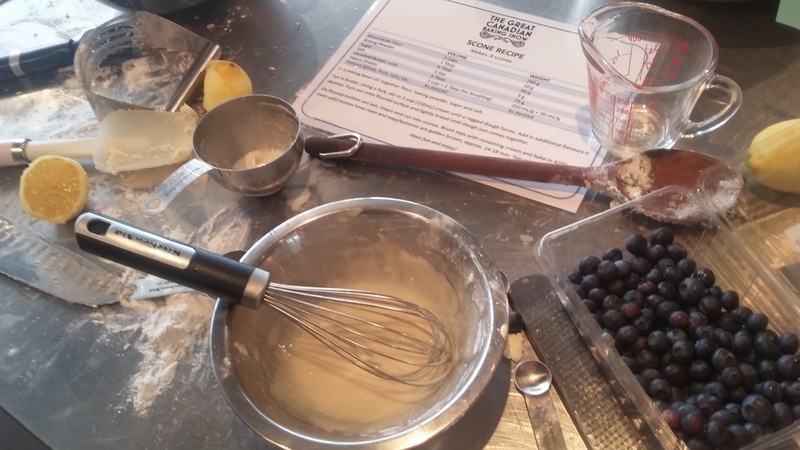 Blueberry and Lemon Scones, baked in front of the judges, in a test kitchen. What with my insomnia and all, I’m often up baking at midnight. One evening as I was waiting for some muffins to come out of the oven, I scrolled down my facebook feed and saw a sponsored post mentioning that the Great Canadian Baking Show was looking for people to apply to be on the show. I figured, why not? I filled in the online application, hit the send button, and didn’t give it a second thought. I’m not one for superstition, but sometimes serendipity feels like it’s congealing into fate. Why do I say this? Well! I found out where the auditions for central Canada were being held. Where? Around the corner from my condo. Literally — not figuratively — around the corner. Someone flew in from Montreal, another came from Sudbury. Me? I walked around the corner. Nice work(place) if you can get it! We were to bring our signature dish to the audition. 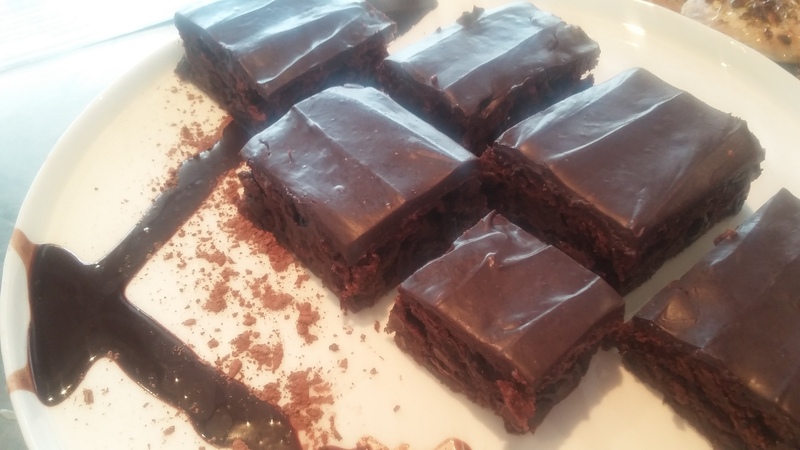 I baked chocolate-cherry brownies, topped with a whipped ganache. The cherries (dried sour Montmorency cherries) were soaked in wine first, for an extra oomph. The ganache was spread ever so prettily with an off-set spatula and looked so smooth and glossy. I brought samples to my workplace and everyone swooned. As I told a judge, I cook with enthusiasm! I felt a bit like outside forces were conspiring to help me out. Everything was just falling into place so easily! NOT BEST IN SHOW, BUT…STILL PRETTY DARN GOOD! I am 99.9 % certain I didn’t make that show. And add in an additional .99999 to infinity. So yeah, I’m pretty sure. Plus, the on-camera interviewer didn’t ask me the same questions that she asked everyone else! I had some great stories and anecdotes to share based on what they asked EVERYONE else, and then they asked me some bland questions. So I felt my brownies were blah, my scones were bleh, and then my answers were bland. Blah, bleh, and bland do not equal #GreatCanadianBakingShow or #CBC primetime. But! 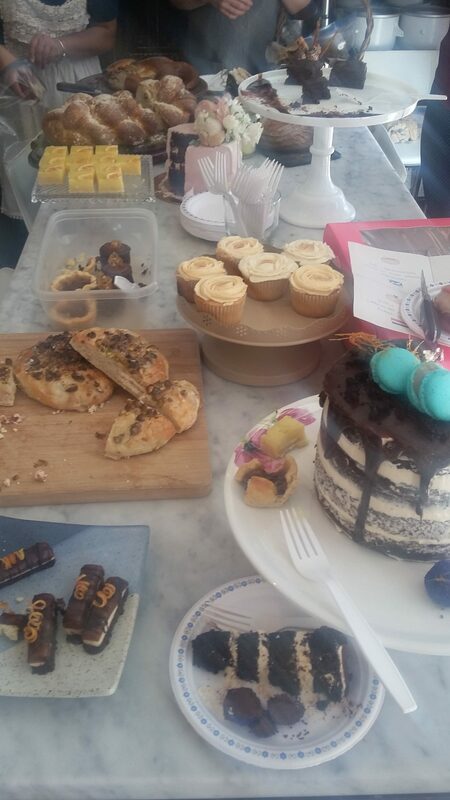 Towards the end of the audition, all the attendees got together and shared their baking. We all tasted each other’s treats and packed some to go home with. My brownies? Gone. They got eaten! The staff of the show and my fellow attendees apparently couldn’t resist a good, solid chocolate brownie. Balm for my wilted ego. Awkward photo of my baking submission, awkwardly plated at the last minute. THINGS I LEARNT WHILE EATING CAKE. AND DONUTS. AND SCONES. AND CUPCAKES. AND COOKIES. Publicity starts with generating buzz. While we had to sign waivers and confidentiality forms, we were also encouraged to take photos with signage and to post/tweet/whatever with “hashtag Great Canadian Baking Show” and “hashtag CBC”. If all the audition attendees, their family, friends, and social media connections, watch the show, well, you’ve just cultivated yourself a pretty large audience, and that’s without doing any actual paid advertising. The majority of the show applicants are white, thirty-something females. And mostly quite slender (How? Do they not eat their baking?). <– I asked several people this, and it turns out a number of them run triathalons or do ironman races. I’ll just be over here in the corner eating my scones, thank you very much. Always pack some chocolate syrup in your purse. #TrueStory At the last moment, when heading out the door to the audition, I threw some chocolate syrup in my purse, along with some dried cranberries, and some cocoa powder. 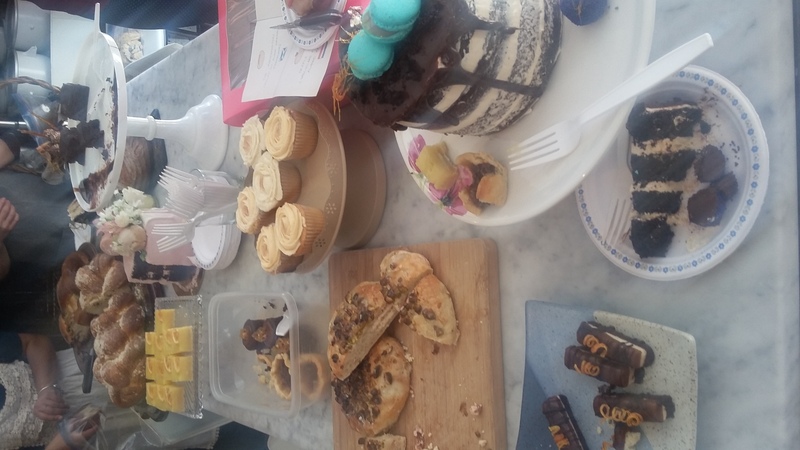 When it turned out that we were to plate our desserts for the judges, I was able to fancy up the cake stand with a dusting of cocoa powder and a few drizzles of chocolate syrup. Phew! An outsize personality will probably get you places, even in sedate, uber-nice Canada. I fully expect the show participants to have some colour to their personality. Me, while I can be both an extrovert and an introvert (that’s a Gemini for you! ), I felt I presented as an introvert, and I don’t think that was in my favour. Speaking of uber-nice, Canadians really are nice! 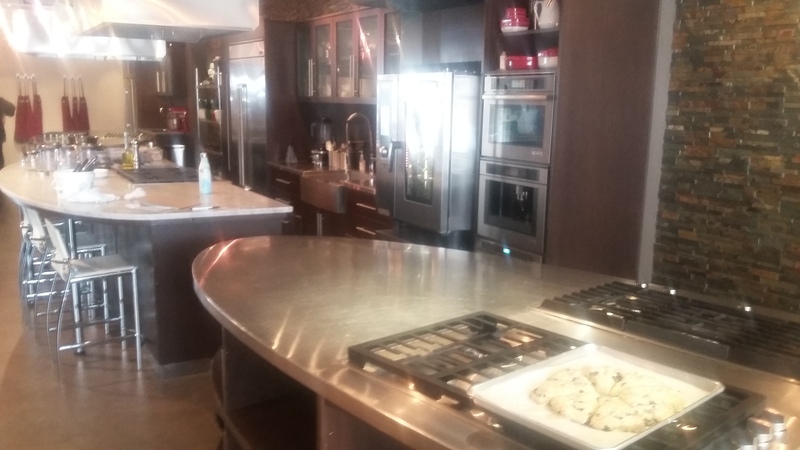 At one point I was perched on a counter in the test kitchen as I was waiting for everyone else to finish up (I finished my scones early! Yay, me!) and I guess I looked a bit discouraged, because several people tried to cheer me up. The judges: “I love cherries. And chocolate!” and “Don’t worry, we know the ovens aren’t working properly. 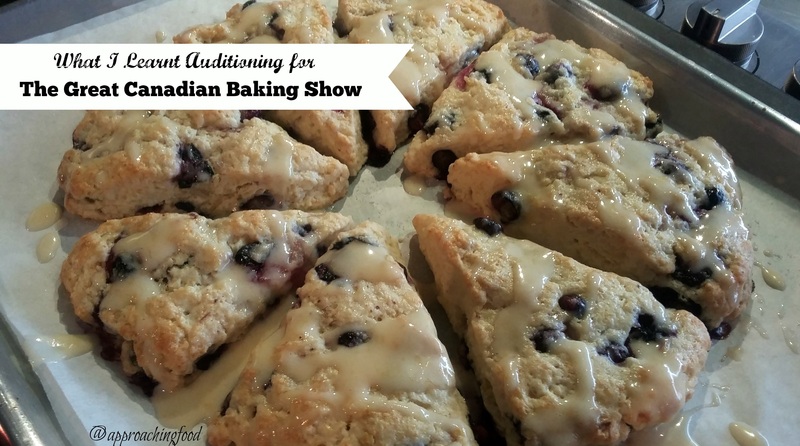 The last group burnt their scones.” Even my fellow audition attendees were super nice: “Here, let me share the cream for the glaze.” and “Oh, you’re not done with the oven? I’ll wait, you take your time.” and “Good luck! I told everyone that your brownies had a special ingredient!” <– Not sure if this was actually helpful. But I know she meant well! Fancy-pants showstopper pieces are the way to go. I was going for flavour, ingredients, and technique, but if I had to do it again, I’d go for something big, like a croquembouche tower crossed with a everything-but-the-kitchen-sink cake, dusted with edible gold and multiple pronged pieces of homemade spun sugar. Think big, think fancy, or go for really simple (but UNIQUE!) and do that EXPERTLY! Messed up ovens will mess you up. I’ve never used a convection oven before and of all the times to start, it had to be at my baking audition. And then that oven didn’t work! I mean, how can a 425 degree oven not bake scones fully when they’re in almost double the time the recipe called for? Felt more like a 325 degree oven. “We just have a few more questions for X,Y, and Z” is code for “You made the cut.” I don’t know for sure that this is the case, but I’m pretty sure! Interestingly, there was a lot of overlap between X, Y, and Z, and who I personally think will make it to the next level. Needless to say, I was not X, Y, or Z. There were four people in my audition that I think have the potential to make it to the next round (or show!). Someone who made absolutely perfect whole wheat bread, semi-rustic style but with a fancy razor-slashed design and dusted with flour; someone who had the perfect personality to show up on TV (loud, fun, and laughs a lot); and someone who made a fancy-pants cake topped with macarons and fresh flowers (and even dusted the flowers with edible gold). An honourable mention for my nominations is someone who made chocolate-dipped shortbread. These were perfect little sticks of shortbread, dipped in dark chocolate on the bottom, dipped in caramel on the top, drizzled with more chocolate, and then topped with the perfect little twirl of candied orange peel. Just perfect technique. My overall takeaway? If you’re auditioning, you do you, boo, and don’t take the audition to heart that much. The auditions are just a snapshot of a certain moment in time for your baking, and if you’re having a bad day (or a bad oven! ), it’s game over, even if you actually know what you’re doing. Enjoy the experience. And anyway…there’s always season two! 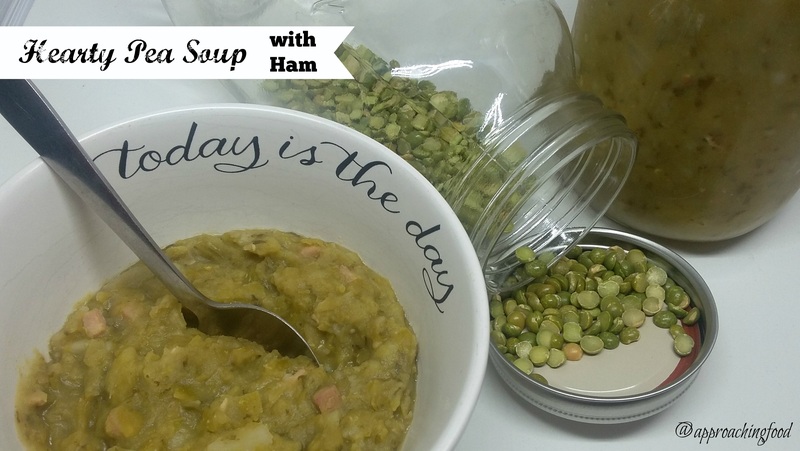 Next Post: Pea Soup, with or without Ham. And what to do with Too Many Scones. All the scones. My freezer is really, really full of scones. Did I mention the scones? This entry was posted in Blatherings on April 1, 2017 by Margaret.